When Spurs Kept Arsenal Out Of Europe . . . Some Arsenal history I found while looking at old programmes: in 1973 Arsenal finished second in the League, but weren’t allowed to enter the UEFA Cup the following season. Why? Because Spurs had won the League Cup! Confused? The ever-archaic and backward looking Football League and FA still had rules in place that meant more than one team from the same city could not represent England in the UEFA Cup, despite England having four places to fill in the competition. This was a hangover from the days of the old Inter-Cities Fairs Cup, won by Arsenal in 1970. The UEFA Cup had since replaced it, but the English governing bodies hadn’t yet seen fit to make a change. This page from the Arsenal programme explains all. UEFA’s priorities were to give places to the second, third, fourth and fifth placed teams in the League, though their rules did allow the winners and runners-up of a ‘national cup competition’ to take part as well. UEFA said nothing about clubs from the same city. 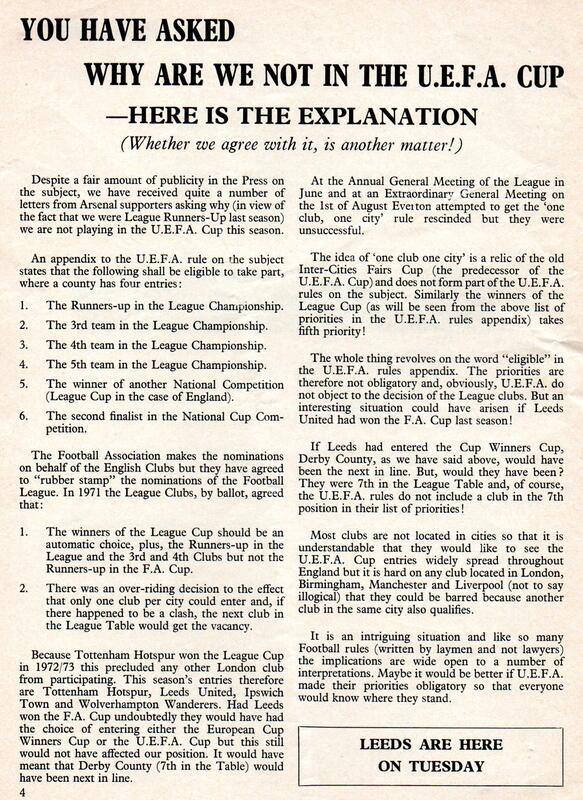 But the Football League clubs had bizarrely voted to keep the ‘one club/one city’ rule, and in order to increase the profile and importance of the League Cup had decided that the winners of that competition took precedence over everyone else. Tottenham, who were on a bit of a run of trophies for the only time in their history, had finished eighth in the League but won the League Cup, condemning Arsenal to a season on the European sidelines. We had to wait a while for the chance to exclude Spurs from Europe – or at least from the competition they wanted to be in – but I feel that with Lasagnagate and subsequent seasons, we have now paid them back. So as far as I’m concerned they are now off the hook and we can let them into the Champions League. Unfortunately, they have Tim Sherwood as manager and Soldudo up front, so are probably not good enough to qualify. Ah well. February 2, 2014 in Uncategorized. ← Arsenal – What Are We On Track For This Season? Yeeeeeaaaaahhhhh! Something to cheer about even though it was 40 years ago! Read it and weep Gooners! Lmfao! That more than makes up for you winning the league at ours 3 times! I love tottenham fans. They’re great. Good piece that, cheers for the link buddy. Seriously, good luck for the rest of the season, your mob have surprised everybody by their consistency. Can’t see you winning the league as I think Man City have a bit too much going for them, but it’s refreshing none the less. I think you’ll make the semis of the CL at least. Great to see ManUre struggling! If only Chelsea would sod off! “Soldudo” That was funny. I liked that. Great piece of history and amusing in that, like all the Spurs triumphs, it happened so many decades ago. Interesting and definite proof that the stuffed suits at the FA haven’t changed a bit….still 100 years behind the times on the 150th anniversary of Association Football. OMGArsenal flagged up one of the things that struck me, that it is strangely reassuring that the authorities were just as incompetent then as they are now. On Spurs finishing 4th. Why not? As long as we win the league to maintain the natural order of things.